Hi friends! It's Thursday, also known as day two of the school year and almost-Friday here! All three of my kiddos had wonderful first days, and I feel really blessed by the gift of great teachers. I've also been gifted with a few extra professional projects that are keeping me bus-y. ...Though I enjoyed chatting it up on Twitter (are we hanging out there together?) and Instagram last night with all my pals who are in New York City today for the Alt NYC conference and all of the rest of us who are not able to be there to soak up the amazingness of the event hosted in Martha Stewart's HQ. I'm joining in Susannah Conway's August Break. These are my anniversary roses from the hubby. 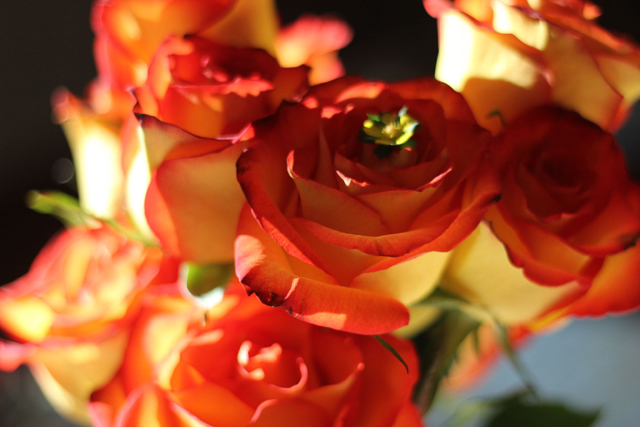 They resemble my bridal bouquet, and I swear I've taken a few dozen shots of these sunset tones. I'm getting a great Tri- to Try ready for tomorrow. See you then!